Happy Monday, ladies! We are so excited to share this first look with you all. About a month ago, I sat in one of my favorite local coffee shops, and had an outpouring of creative vision for this series. This time of year, we're all looking forward to upcoming weddings, formals, dinner parties, date nights, and a slew of other fun events that come out with warmer weather. Whether or not you are already thinking of your hair and makeup for those events, I wanted to provide several looks which could be used as inspiration for you, if even a little, for this coming season. I used different women of different ages, and played up their natural assets to create a look that is great on them, great for spring, and versatile enough for several events. 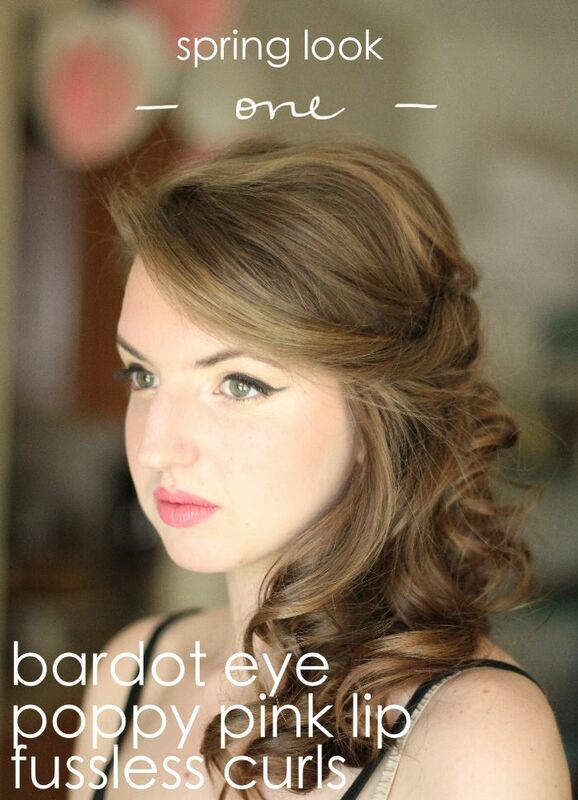 I have been loving the "Bardot" eye for spring, which is essentially a bold, winged top line, made soft by the rest of the subdued look. Steph has naturally big, gorgeous eyes and we wanted to play with that shape - but the Bardot is especially great for gals with smaller or inset eyes, because it brings the illusion of the eyes up (bigger) and out (wider). The pink lip pairs well with the bolder eye, and brightens up the whole face with a playfulness perfect for spring. The curls take a little extra time to prep, but once done, they look soft and bouncy, and have super staying power. Just like anything in life, give yourself grace and a little bit of time when trying something new, keep practicing, and make any adjustments that you like. Let us know what you think! Layer up the liner! We used 3 (yes, 3!) different types of black liner for this look - a basic black pencil, a gel liner (you can use liquid), and an angled brush with black powder liner (you can use black eyeshadow). Start with the pencil, using small strokes into the top lash line. Then use your gel or liquid liner, and define the top line further, all the way from the inner corner of your eye to beyond the outer corner into the wing - just think Thin - Thick - Thin for the wing shape. Then, soften the line with your powdered liner (or black eyeshadow) using an angled brush. The different liners ensure that you can flub and fix without stressing. Don't be afraid of the false lash. It's a little intimidating, but these days, there are plenty of natural looking false lash strips out there. 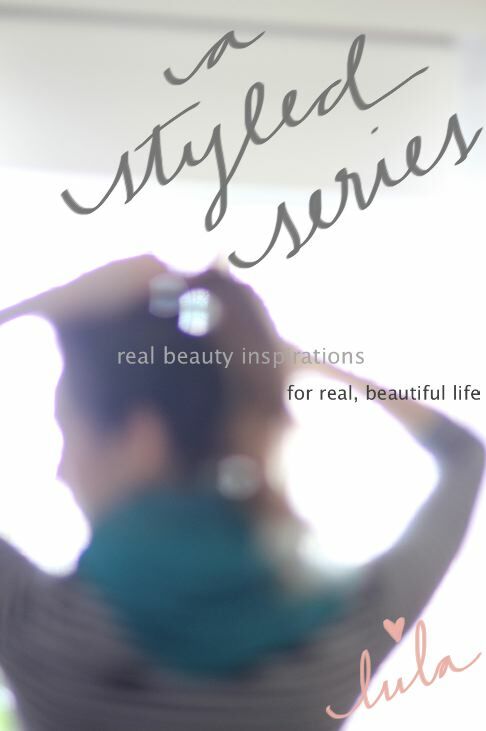 Our favorite brand is Ardell in "Natural" - and guess what? You can trim the width of the strip before applying to fit your eye specifically, so it doesn't look like your eyes are about to start flapping and take flight. Highlight! Use a highlighting eyeshadow (any cream, white, or champagne color will do) after completing your liner to brighten things up. We applied it to Steph's brow bone, the corner of her eye, along her bottom lash, and along the bottom of the "wing" of the liner. Brighter in the tube, lighter on your face. For those of us who tend to shy away from lip color, just remember that the way it will look on your face (and especially in photos) will be a little lighter than it looks in-store in the tube. Take a trusted friend with you to Target or Sephora or wherever, and hold the tube up to your face to discuss which pink will be a good match for you. Bright pinks look fantastic for spring, and on any skin tone! Prep your lip. Just like with a red lip, we like to gently brush concealer on and around the lip before applying the color, which helps the color stay put a little longer. Comb out the curls with your fingers. Especially if you use the steps above, those curls are gonna be bouncy when you un-pin them. Do not be put off, because they will fall into more gentle curls, but still maintain their shape for at least 1 cha-cha-slide, 10 "I haven't seen you in forever" hugs, and 1 round of "Shout"
Pin 'em up or leave them down. Soft curls are easier to play with, while still maintaining their shape. We pinned some of Steph's up (and THEN hairsprayed the heck out of it) but they would look great down for a more simple occasion! THANK YOU to all of you who entered the Spring Pick Giveaway! 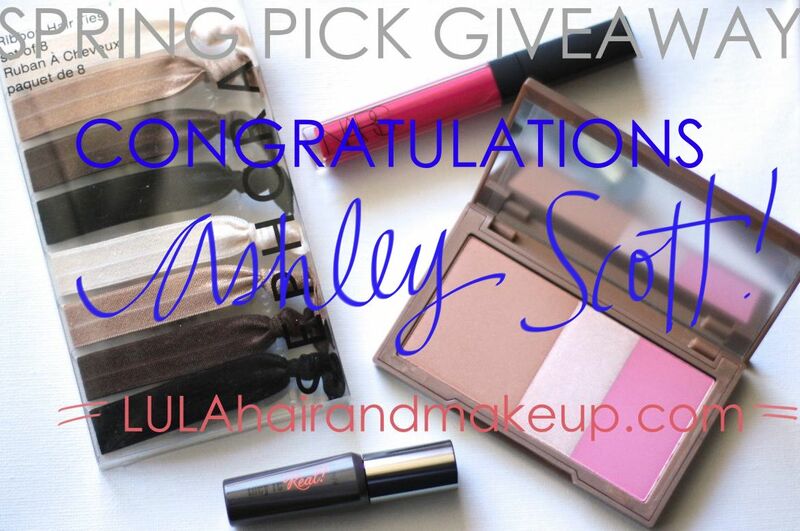 Congratulations to Ashley Scott for winning this awesome loot! Email me at lulahairandmakeup@gmail.com to claim your goodies!